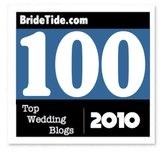 "Amy Jean, the Bridal blogger at THE RELENTLESS BRIDE describes herself as "**... a girl from the OC on a mission to try to plan "my" perfect wedding from DC to be held in So CAL on a Budget ...** " An attorney whose self-description consists of a laundry list of adjectives, delights her readers with give-aways, featured articles and how-to's. Her creative blog posts can be found every Monday at Weddzilla Blogspot , daily at Get Married Bridal bloggers , regularly at The Uberbride and Flirty Guide Bridal blogs . 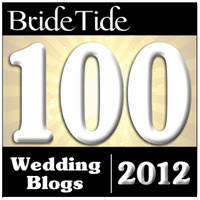 She's also been a featured blog author at Celebrate Intimate Weddings . All of this blogging not only keeps this wedding planning princess busy, but has landed her the coveted SITs blogger recognition post. If you can't reach her at one of the aforementioned blog hangouts, she can be twittered for your reading pleasure. 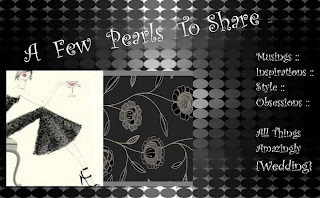 AmyJean, congratulations on being "A Few Pearls to Share's" BRIDAL BLOG OF THE WEEK!"